With Kyle traveling back towards Seattle after a month in Montana and Nevada, we decided to give Mt. Hood another try after our failed attempt last month. 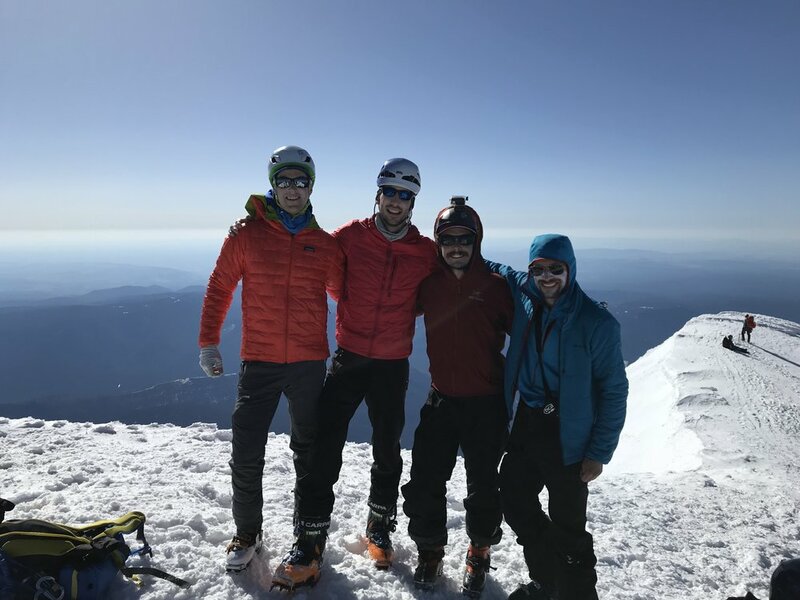 This time we would be joined by two of his friends, Zach and Jared, and had a much better forecast for our climb, which happened to be Mother's Day. Kyle arrived in Bend just after 7pm Saturday night, completely wiped out from his long drive from the Nevada desert. I had hot supper waiting so we quickly ate, repacked our cars, and watched a few music videos before ultimately leaving at 9pm. The drive to Timberline lodge took just over 2 hours and we quickly parked, ignored the "No Camping" signs in the lot, and settled in for our second Karen bivy. Sleep was fitful and we woke up at 4am to strong winds, but happy to be out of the car and preparing for our ascent. Our goal departure time was 5am and by the time we made breakfast, had instant coffee, and found Zach and Jared, it was 515am. Headlamps were barely necessary as we began our skin up the standard climber's trail to the east of the ski area. The snow was quite firm at this early hour and we did experience some slipping on steeper pitches heading up the Palmer snowfield. 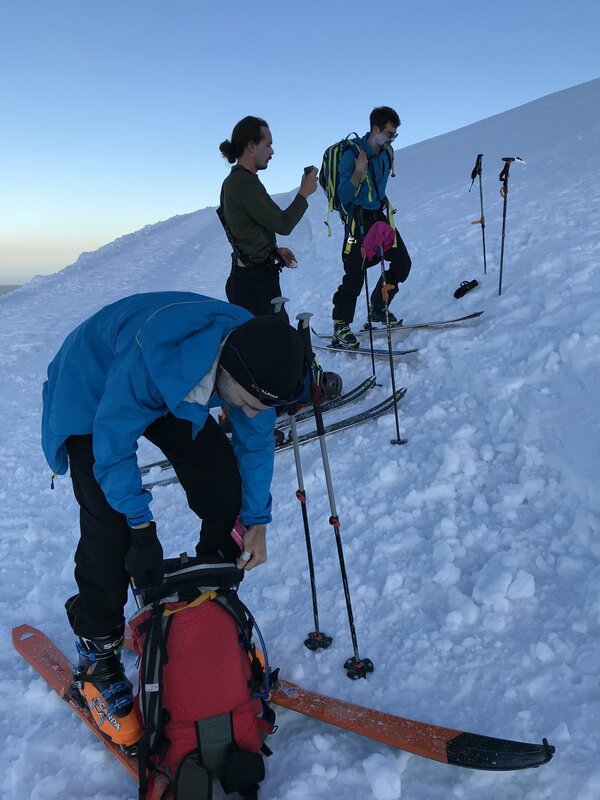 I was happy to have my ski crampons and the other guys made due with lots of switchbacking up the ZigZag glacier until it became too steep just before Crater Rock and we all put our crampons on. Stashing our ski gear near Devil's Kitchen, we refueled and set off for the last 1,000 feet of ascent with ice axes at the ready. Upon the Hogsback we said no thanks to the line of folks both ascending and descending the Pearly Gates and chose to ascend the Old Chute. This turned out to be a good decision, even though it is a longer distance to travel, we were able to keep moving and didn't have to stop in the shade and wait for other parties in the narrow space of the Gates. The weather was perfect atop the summit, barely any wind, and cell phone service for calling lucky Moms. Zach and Jared made Mac n' Cheese which was most welcome and we proceeded to lounge on the highest mountain in Oregon for nearly an hour. Descending, we chose to take the Pearly Gates as the traffic had died down and we were able to face toward the mountain and carefully kick our way down, following the footsteps of the many who came before us. Eventually reaching our skis around 10:30am, we quickly ripped skins and prepared for 4,000ft of turns. The first 500ft were still a bit hard, but we found the smooth corn halfway down the ZigZag glacier and smeared blissful turns all the way down into the ski area boundary. The final slopes leading to the parking lot were a bit sticky, however we skied all the way to the pavement without incident at 11am. Change of clothing and footwear followed by burgers and beers at Charlie's Mountain View in Government Camp capped off an excellent morning. Too soon it was time to go our separate ways with handshakes, hugs, and promises to get together again in the near future.